I know it's not Sunday anymore, but as I intended to post this yesterday as an installment of my irregular and random "Sundry" posts, I'm sticking with the theme. Things like that happen when you procrastinate. Sunday turns to Monday, the days to months, and so on. It's amazing that we're smack dab in the middle of summer already. I notice the stores are starting to get back-to-school stock on the shelves and that seems way too early. But I'd be the worst retailer ever with my tendency to put things off. Where are the spiral notebooks and pencil cases, you ask? Oh, we'll have those out by Halloween. Let's climb aboard the random roller coaster, shall we? Dialing back a month or so ago, my chives were in blossom and around that time, I saw an interesting blog post about how to make chive blossom vinegar. So I did. HERE is the link to the instructions I followed, but basically I snipped a handful of blossoms, put them in a pint jar, and covered them with vinegar (I used rice wine vinegar, but I think any clear vinegar would work). 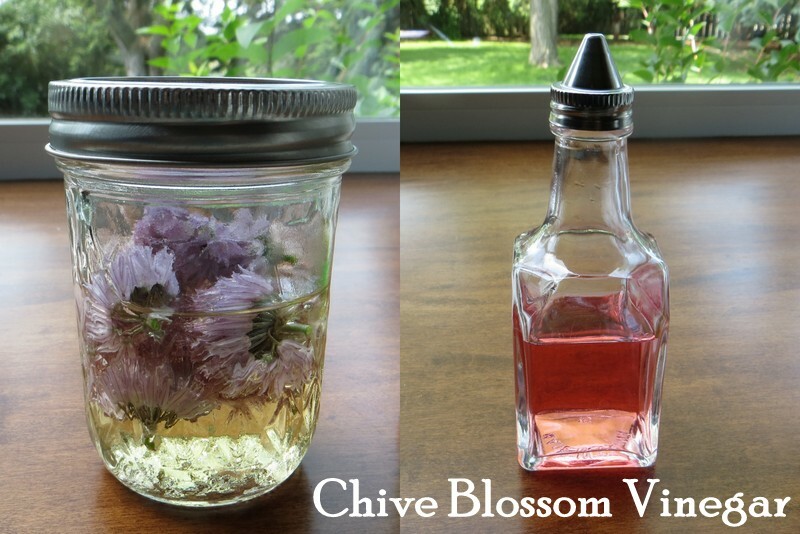 Put a lid on it and set it aside for two weeks, then strain it, and voila—pretty pink chive blossom vinegar! It has a mild onion-like flavor that goes well in oil and vinegar dressings, etc. Some other recent snapshots of the flora and fauna around here include this pair of goldfinches having a breakfast of seeds from the spent purple-flowered spiky things in my garden, the name of which I don't recall. And this little dragonfly resting on the hostas. Last week, we took a mini-vacay to Galena, Illinois for a couple days. It's an historic, once thriving old mining town whose downtown area has been nicely restored and features many shops, antique stores, boutiques, and restaurants. It was also the home of Ulysses S. Grant, as well as a number of other generals and officers during the time of the Civil War. We visited the local museum, which houses the famous 14-foot original oil painting entitled "Peace in the Union" by Thomas Nast, depicting the surrender of General Lee to General Grant at Appomattox. A lot of interesting history, including that of the lead and zinc mining industries so vital to 19th century Galena. The streets are steeply terraced from the river valley. We learned that twice a day, at noon and after work in the evening, Grant would walk up these steps from his family's leather shop on Main Street to his house on the hill. (We also learned that he stood 5'8" tall and weighed 135 pounds, and his wife wore a size 4 shoe, which was average in those days—wow, people were smaller then). Later that day, I coaxed Norm into making the same trek. We only went up the steps once, however, which was enough to make my leg muscles feel jittery for a while afterwards. This view is somewhat deceiving, as we had already walked up one street level when I took this picture, and beyond the end of the steps you can see, there were another couple dozen we climbed to the next street level as well. I counted 245 steps on the way down, give or take a few. We drove up to Chestnut Mountain Resort a few miles outside Galena for a view of the Mississippi River. On the way back to town, Norm spotted these barn quilts, so I pulled in for a closer view. As I was walking back to the car, I noticed these huge thistle blossoms, the largest almost the size of a tennis ball! Beyond the thistles, a few sheep grazed lazily along a stony creek bed. Such a lovely bucolic scene. Back home, I've started another kennel quilt. I'm making big half-square triangles for this one, which will end up probably 42 x 70 inches, the largest one so far. Did a little thrift store shopping this weekend, where I found a vintage paint-by-number to add to the collection. A dollar ninety-nine, what a deal. I took it out of the frame to clean the glass, where I noted the toy company and name and number of the panel. This one probably dates to the late 1950s and is in really good shape. The somewhat shaky execution of the paint job is all part of the charm! Now it's back to a normal work week for us. How's your summer going so far? Thanks for taking me along on your mini vacation. I needed the break and Civil War history is fascinating. When Summer has finished over there could you please send it down here. Lots of Summer gorgeousness in this post. My goodness General Grant would have been fit walking up and down all those stairs and his wife shoe was a size 4...really? Wow that is tiny. I wonder how we have all morphed into such Amazons! I must say the barn quilts are wonderful and how pretty does the chive blossom vinegar look....we all know 'it's all about the look'. I enjoyed meandering along with you in the lovely, Summery post. What a lovely meandering post -- worth a couple of read-throughs and savors! Happy summer to you. That vinegar looks fun to put together - I may give it a try! This is the perfect post. The Perfect Post. It's a joy to see the nature you notice, and the special places you visit. Thanks P! I've been remiss in my blog reading...sorry. Love the randomness of this post as you know (very well) that's how my mind works. Get deal with the $1.99 pbn. It's got a very modern vibe and I think the colors are great. Oh my those stairs! You had a wonderful mini vaca with so many interesting things to see and do. How fascinating about the General being sensitive to the feelings of all the ladies who sewed that beautiful flag. I've never seen thistle with blossoms that full before. Maybe we all ought to be using sheep poop in our gardens, eh? PS, forgot to say that your garden photos are lovely, even without the sheep poop. What a lovely post - I really enjoyed your meanderings. I liked the photos, especially the goldfinches (which are different from ours) and that enormous thistle flower: I love a good weed. What a fun post, and even more fun trip for you! The "spent purple-flowered spiky things in your garden" looks like perennial salvia to me? If you cut the dead heads off, you should get some more blooms from them. Chive vinegar is delicious!